3 How Important Is Your Toilet Seat? 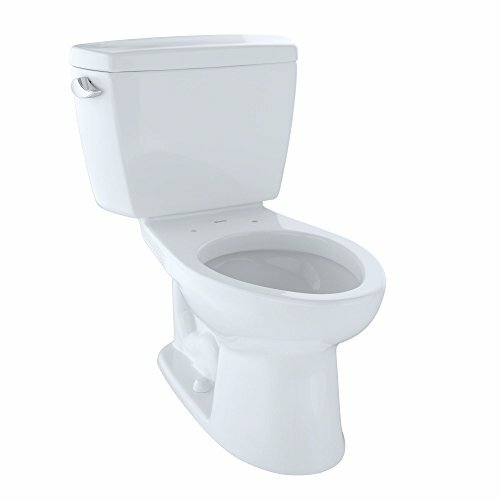 4 How to Choose the Right Toilet for Me? 7 What Kind of Toilet Bowl Should You Go For? 8 What About Toilet Size? 9 How Do I Get My Toilet Flush Stronger? At one point in time, the biggest water drain in a household was the bathroom toilet. It used to top out at 4+ gallons per flush (GPF), basically accounting for almost your entire water bill. Thankfully, the industry steadied and the standard became 1.6 GPF, which is a great improvement, but still high when compared to other appliances in your home that use water. So are the new toilets that use 1 GPF better than everything on the market or is there a hidden compromise? This guide explores the reasons why you should consider all types of toilets when making a purchase rather than defaulting to a product that is more efficient than it is useful. Even the most feature-rich toilet in the world is useless without a proper flushing system. There is a lot of lingo being tossed around when it comes to branding a particular system, but in the end, they all have one goal: removing as much waste as possible. And it doesn’t end there. As well as removing waste, keeping it down is just as important, so you don’t have to do the dreaded double flush. How efficient a flushing system is at cleaning the bowl is also important. While some only concentrate on a certain portion during flushing, quality flushing systems clean 100% of the bowl area when flushed. Knowing your flushing system will go a long way in choosing your toilet. It’s very important, which is why a lot of brands don’t include a toilet seat with the purchase of a toilet. Buyers that drop a grand on toilets end up replacing the built-in seat due to personal preference. Some like hard wooden seats since they adapt to cold weather better. Others like soft, plush seats so that they can relax and read the newspaper while in the bathroom. Some toilet seats carry stains a lot more than others, while others are cheap and shatter if too much force is applied. When you go out and make a decision to purchase your toilet, part of that deal should always include looking for a great toilet seat. With all of the decisions that can go into choosing a toilet for your bathroom, there is pressure to make the right choice. Toilets are not cheap toys, and making a bad choice can lead to installation issues and loss of time. Since there are so many options in the industry, narrowing down what you want and need is essential to having a good experience. So what is it that you want and need? Looking through the features of the available toilets will go a long way in answering this question. Not only will you make the correct decision, but you’ll save a good amount of money. When choosing between one or two-piece toilets, there’s a common misconception that a one-piece unit loses more value when it breaks. One-piece toilets definitely outweigh in pros, with the only con being the high price. But wouldn’t you expect to pay a higher price for a superior product? This guide explains why customers are still split between purchasing one-piece or a two-piece toilets, even when one is superior to the other. The market is changing, but the question is: will it change in favor of the one-piece or will the two-piece stay dominant? Everyone wants a sanitary toilet, since bacteria in a bathroom setting can multiply 100 times faster than in other areas of the house. These brands have done a great job in providing customers with built-in sanitary measures like resistant materials, bowls, and coverage when flushing. But for the customer who wants to take it a step further, there is always the option of using extra sanitary products and devices to make sure that your toilet stays pristine and clean all through the year. This covers everything from the cheap dollar store drop-in tabs to expensive self-maintaining systems. This is one helpful guide that you’ll definitely want to dive into if you plan on purchasing a toilet soon. What Kind of Toilet Bowl Should You Go For? Choosing a new toilet is complicated, and it can get even more complicated if you forget to look at one of the most important aspects; the bowl. A great toilet bowl can make or break your purchase, as all the water power in the world won’t get rid of waste from a subpar toilet bowl. Although porcelain has become the go-to material, there are some interesting options for the more curious buyer. Consumers have flocked to some makeshift mashups that have become popular for their durability and ability to keep the bowl clean. This guide will showcase some of the best toilet bowl types and why you should lean to one over the other. Of the many decisions you’ll make while choosing a toilet, the size is definitely bound to come up since your bathroom may not be a good fit for the model you want. A lot of customers purchase a new toilet without taking measurements to see exactly what it is they have room for in their bathroom. Choosing a toilet that’s too big can lead to cramped seat space, while choosing a toilet too small can inconvenience some of the adults in the home. Thankfully, there are a lot of toilets that have a one-size-fits-all mantra; the perfect compromise to make everyone happy. But in situations where size is a really important factor, which one should you choose? How Do I Get My Toilet Flush Stronger? Although it may sound strange, it is crucial that you understand how your toilet works in order to get the most out of it. Toilets today are advertised with many features, but some features are not even worth the price tag. However, one of the most important feature in a toilet is a strong flush. Therefore, if your desired toilet is advertised with a strong flush, you should seriously consider that toilet because you will be hugely disappointed if you invest in toilet with a handful of features that don’t include a strong flush. However, if you already have a brand new toilet but you are not happy with the flush, there are ways to modify the toilet to optimize its performance and the best part is, it does not cost much to do. The so-called gravity-feed toilets have been competing with pressure-assisted toilets for a long time. Although gravity-feed toilets are more popular, pressure-assisted units are becoming extremely desirable and it has turned into a love-hate battle between users. Manufactures were quick to adapt to the market and they have been able to create fantastic high-quality toilets that combine the best qualities of both types. Pressure-assisted units are known for their stylish designs, reliable performance, and high-quality construction. They are ideal both for commercial and residential settings and manufacturers have been able to provide top-notch toilets that fit any setting that don’t break the bank. If you are looking for a toilet that features consistent performance along with quality construction, then you should consider getting a gravity-feed toilet. Gravity-feed toilets remain the most popular type of toilet on the market today. They were designed with the consumer’s needs in mind and this type of toilet continues to be the number-one pick. The best part of investing in a gravity-feed toilet is that there are very few mechanical parts to deal with compared to other types. Therefore, the production process is easier and simpler, resulting in a better price for the buyer.